Here I’m building the print plate and several connecting pieces. One thing that’s different about these are the “infill” – the lattice of Supports inside the pieces. For most of my stuff so far infill has been about 15-25%. These have to withstand some pretty strong torque and pressure, so they recommend 50% infill – so basically halfway to solid plastic. Six screws and a piece of felt and I’ll be ready to print! My first piece as I get acquainted with the Bodgery makerspace here in Madison: a “maker coin” designed by Naomi Wu from Shenzhen, China. Visual Practices: What’s in a name? One of my frustrations with the current “crossroads moment” I’m in is that I am once again pursuing a career path that requires explanation. My very first “goal” in a career was to become a “shaper” – based on a made-up science-fiction job of a person who created environments for zero-gee dance. As an idealistic undergrad, I put that title on the business card, thinking that it would be the start to a conversation – and it was. I simply wasn’t prepared for how tired of that conversation I would get. Same thing happened when I started working as a “creative”, and also as a “open-space facilitator.” Often I would simply dodge the conversation and say “I’m an event producer.” People didn’t understand really what that was, either, but they thought they did – it sounded like a real job – so it was sometimes easier to use. 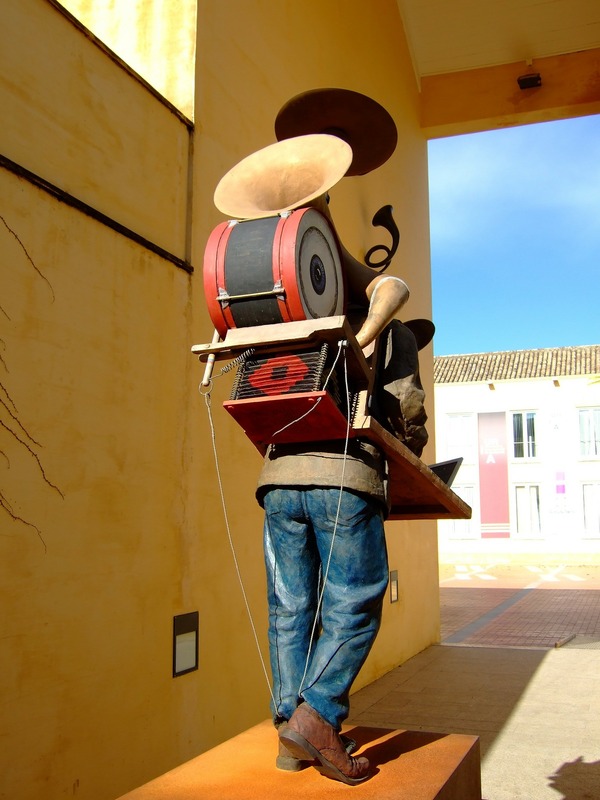 I am the epitome of the person who wears many hats (or, as I’ve been thinking lately, a version of the One-Man Band epitomized by Bert in Mary Poppins) and I like this title because, in my mind, it is more about a way of doing things – a practice – than a job in and of itself. Visual practitioners can be counselors, bloggers, facilitators, cooks, whatever – they simply integrate the visual part of it into whatever job they do. It becomes more of an adjective (or maybe adverb?) than a noun, in my mind. In my mind, this would change in title to “synthesist” and it appeals to me because the ability to synthesize information into a useful form is one of the most crucial skills needed in this latter part of the Information Age. I tell my own kids and grandkids that it’s fine to learn about subjects that interest them – but the most important skill they can learn is figuring out how to learn, and how to learn quickly. One of the most resonant parts of Kelvy Bird’s writing and practice is the idea of tapping into and becoming a conduit for the “source”. In my mind it can (to some extent) represent the kind of Jungian collective unconscious, but more immediately I feel that this is a skill that can be used to perceive the gestalt of any particular group, synthesize their interactions and have it expressed on the wall in a form that helps them understand the concepts and conversations even better. The ideal form (in my mind) is that it has no particular component of my own biases or opinions – the goal is to serve as a synthesizing agent for their experience in a non-time-based second-person-plural iconographic format to complement their linear-time-based, verbal/written and first-person subjective experience. Part of my personal practice lately is to try and de-center myself in my work, or at least leverage the privilege I have in an effort to “first, do no harm kind of way and possibly help others. This comes from a growing awareness of the power projected simply by my demographic (cis het-presenting white male) especially among the populations I serve with my work (such as LGBTQ communities) as well as continued horrified understanding of the damage that has been done (#MeToo is the obvious example, but there are so. many. Others.). This is one of the reasons “Scribe” very much appeals to me as a title, because it is non-authoritative. You don’t heard about “alpha scribes” or “how to be a Fortune-500 Scribe” or “the Morning Routines of the 1% Scribes.” At the same time, it is a skill, and a skill that is put out there for the service of others. I’m also not entirely altruistic, and I recognize that a truly good scribe does have a lot of power, and can be an essential part of an organization’s success. I confess that I also am working through some of the resistance to the word “art” and so borrowing from a tag that I had on a notebook also appeals: “Artisan Scribe. While that might bring to mind small-batch man-buns and hipster mentality, I think it can also help express that this is not simply a literary scribe, but also one who uses images in a careful and hand-crafted way to further empower the messages being inscribed. 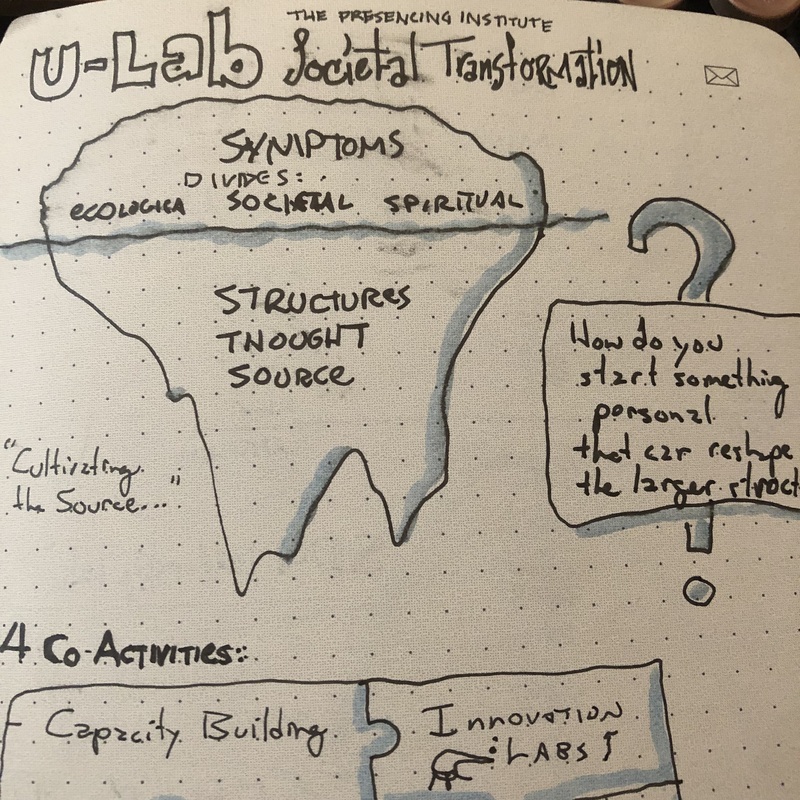 In short: when talking to others, I like “visual practitioner” and “visual synthesist” best, but for my internal practice and ideals I am striving to become an Artisan Scribe. To say that the Land of O’s is one of my favorite clients would be the understatement of the year. 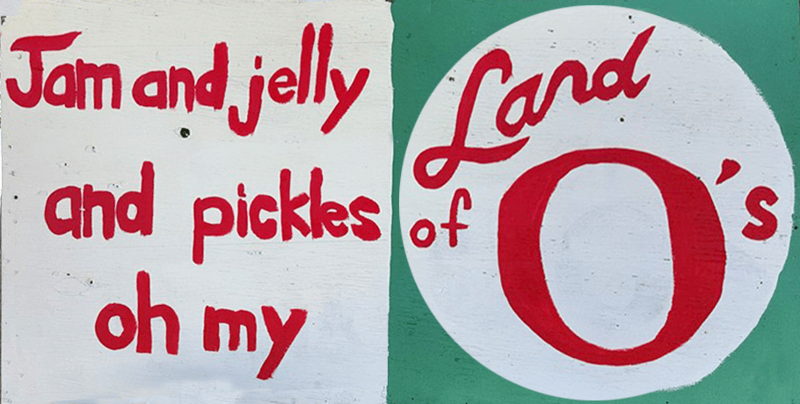 They have been producing excellent jams and jellies and other goods for the local Madison Farmer’s Market for the past couple of decades, and recently engaged me to help them improve their online presence. 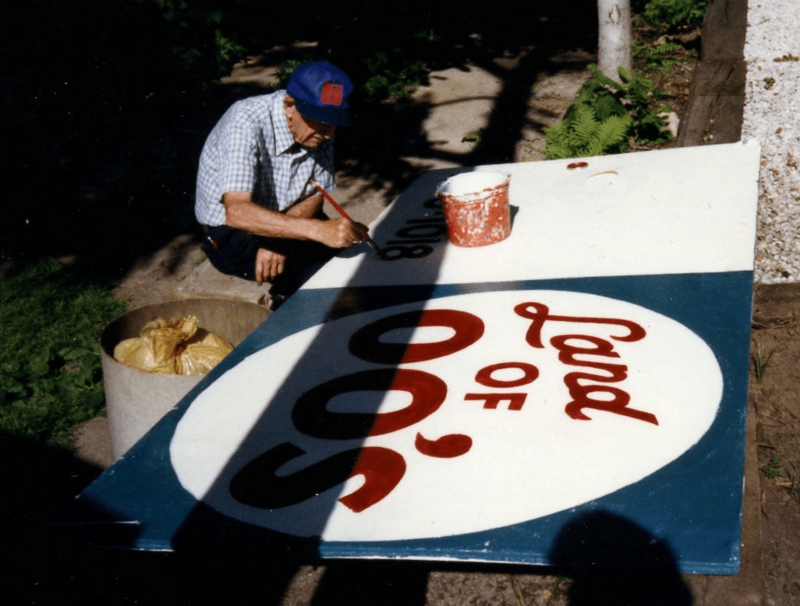 This isn’t just any old sign, mind you – it was painted by beloved local artist and sculptor Sid Boyum, whose whimsical works dot the Madison landscape and who happened to be a neighbor of the Oosterwyks. I definitely wanted to keep the feeling of the sign even in a digital medium as we created their newsletter. It’s lovely to be able to take some of the old and bring it into the new, retaining the hand-crafted skills in a digital medium. 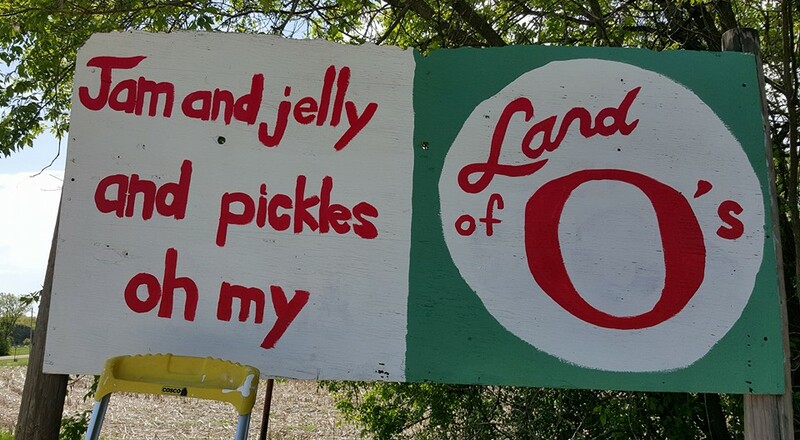 You can find Land of O’s at the Madison Holiday Market on Saturdays this winter, and also sign up for their (upcoming) newsletter for more pics from the family farm, the down-low on Aronia, and a spicy recipe for their cranberry-horseradish relish! For this particular session, though, I confess I overstepped the bounds of the normally “neutral” graphic recorder. I happened to know the presenter pretty well, and he’s a very knowledgeable person – so well-versed in his field of data forensics that he can sometimes go far beyond the simple topic at hand. That topic was a version of the “crypto-party” movement, designed to help everyday folks become more secure in their digital lives. This particular class was for LGBTQ and other alternative communities (which is part of why sections have been mosaicked for privacy) but was not for a particularly tech-savvy crowd. When I was preparing the poster, I made sure to prominently write “WHAT CAN I DO?” at the center of the poster. My hope was that as he glanced at it during his talk it would help anchor him into the actionable items that would relate to the audience. While I feel a bit guilty about this subtle manipulation, I also am happy that it worked and his talk was well-received. Even better for me, we posted this in the hallways of the convention and I saw multiple people stopping, reading, and discussing it as the the days went on. What do you think? Did I overstep my mandate? Or did I contribute to the talk in a positive way? Here’s the thing: it’s not. It’s not doing it to you. In fact, here’s a secret that I’ve learned since I began my techie journey putting together little printed circuit boards from Tandy: technology wants to work. Really. It’s made to work, designed to function, in fact usually with a very simple function in comparison to, say, our bodies. Unlike our bodies, there’s no question or debate as to whether technological devices were created via intelligent design (the debate as to the level of intelligence, though, that’s the subject of many a thread…). You can leverage the fact that technology wants to work with these five simple rules. Why use them? Well, let me put it this way: I have a reputation, both personal and professional, of being someone who can get things to work. Projectors, presentations, databases, sound mixers – at some point I’ve been asked to “fix” something. It’s not a bad reputation to have, to be honest; it’s put food on my table more than once, and even led to a really nice date now and then. At an imprecise but nonetheless probably accurate estimate, 90% of the “skill” I have at getting tech to work comes from following these five rules. I’m not saying they’ll solve all your problems – but I feel safe to say that if you follow these principles first you’ll save yourself a lot of time and gain your own reputation of having the “magic hands” that just get things to work. You and I will know that it’s not magic; the things want to work anyway. But don’t tell the rest of them. It works better if it’s plugged in. It works better if it’s turned on. It sounds better if it’s turned up. Remember: somebody, somewhere, thought this was intuitive. When all else fails, trace the cables & restart. That’s it. In that order it will solve most the problems you have with all sorts of technology, from plumbing to home theaters to that great pitch deck that you’re hoping gets you funding. Print out the rules and post them near your trouble-spots, and I promise a reduction in the median blood pressure of your staff. Also, stop swearing at the poor machines. They want to work. A client presented me with an interesting challenge: “Gray, I want to be able to just call a number in my phone, talk, and have it show up on a podcast feed.” Sounds simple, right? In a world where content is king and podcasting has been around for over a decade, there’s got to be a simple turnkey edition that will do that, right? Not so much, as it turns out. There used to be – AudioBoo.com was a prime mover in that world, but it quickly reduced the offered time to the point where podcasts couldn’t really work. Cinch.fm died, Spreaker is out there but is really proprietary about the content, audience, etc…The more I looked, the more I was surprised at how much you had to pay for convenience by surrendering control. I set about to find a better way. It is, of course, only one better way. There are probably seventeen startups happening as I write this that are planning the very thing I’m talking about. First is the “long-form” podcast which is fairly easy to set up, a little complicated (and requiring either wifi or cel data) to operate, and offers pretty much unlimited time. Second is the “short-form” podcast that is pretty esoteric to set up, dead easy to operate (just dial and talk), and is limited to 2 minutes maximum. Think of it as the podcast form of Twitter. Log into your LibSyn account. On the Feedburner site, copy that URL into the “Burn a Feed Right This Instant” field (and check that you are a podcaster) and click “Next”. Now Feedburner will ask you for a “Feed Title.” Make it clever and descriptive and include keywords – just like you were titling a book. “The Traveling Tips Podcast”, for example. It will also ask you for a feed address. This is the URL that you’ll be telling people to use to subscribe to your podcast. You want it to be easier to remember, since it’s going to be pasted onto the end of “http://feeds.feedburner.com/”. So if I was going to use the above example, I’d probably try for “traveltips”. Notice how there are NO spaces or punctuation in the address! Click “Next >>” again, and it will be done! You now have a way for Feedburner to tell the world about any files you put into Libsyn. Now it’s time to make that happen! Just press the “REC” button twice and you’re in business! If it asks, let VRP have access to your phone’s mic. You can pause (to catch your breath, to find your place, to do whatever) and then when you’re done just press stop. If you didn’t get it right, just hit record and do it over. Yes, there are ways to edit podcasts – but that’s not what this post is about! The old title is circled in red. Select it and put in your new title – easy! Now your recording will appear with the time and date on the screen. 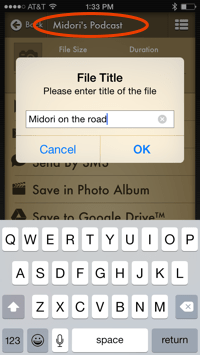 Select it, and then tap the top of the screen to give it a more friendly and accessible name. This is basically just for your benefit, so make it something you’ll recognize. 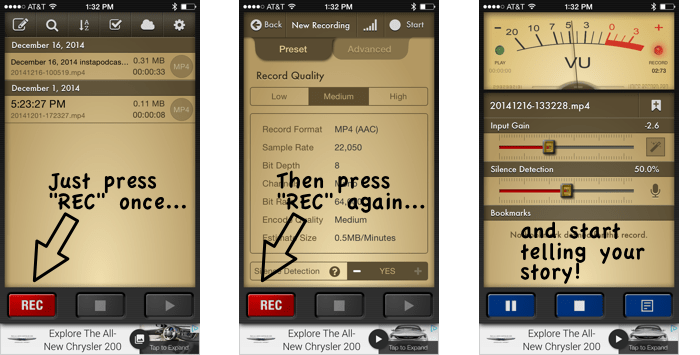 Once you have a recording and you’ve named it, Voice Record Pro will give you a LOT of options of what to do with it. Google, Facebook, Twitter, even some things that hardly anyone uses. You, however, have a spiffy Libsyn account that is just waiting for your content. So what you will select is the “Send to FTP Server” Option. The Upload Folder is “/quickcast”. This means it will go up and instantly be put into your podcast feed! configure your podcast upload once and you never have to do it again! Make sure you “save these settings” and, if you feel secure, “save password” too. That way you won’t have to do it again. Hit the “✓” and it will send off the file to the Libsyn server. It may take a while if you have a long recording, and if you are using cellular data. Be patient! Once it’s uploaded, though, you’re done! Libsyn will put it into the “feed URL” and that will let it show up on your Feedburner page – which, when you send people to it, will give them lots of ways to subscribe to your podcast! 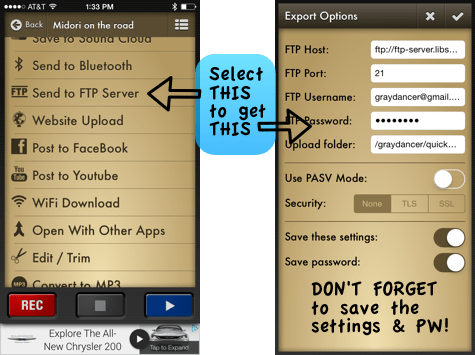 If you want to submit your podcast to iTunes officially, you would need to follow these instructions. You also probably want to consider using some keywords, special descriptions, and creating specific cover art for the podcast. It can get pretty complicated, and if you would like to hire me, I can help you make it happen! But for right now, you have everything in place for a rich content-filled podcast. Next week: the step-by-step chain to make micropodcasting your reality!